One of the highlights of my trip to Alaska was experiencing a flightseeing trip to see the Alaska mountain range and Mount Denali with Talkeetna Air Taxi. 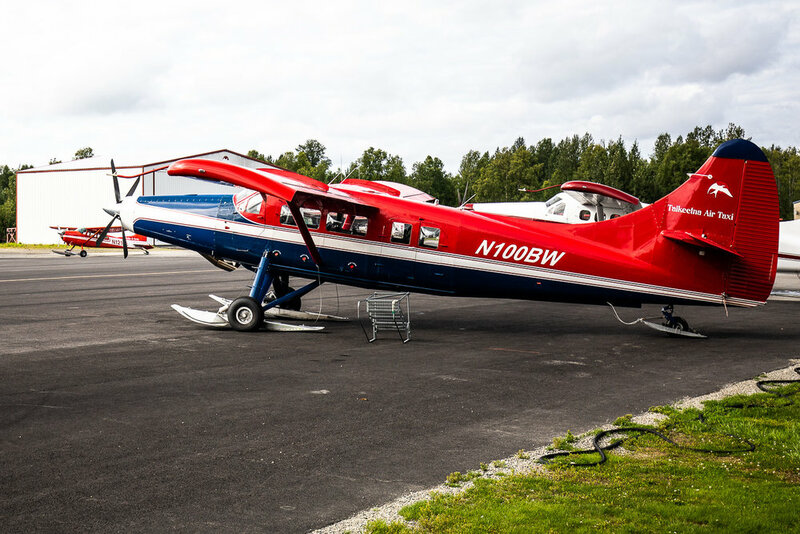 Talkeetna Air Taxi offers three types of flightseeing tours: Southside Explorer, Mountain Voyager, and Grand Denali; each of these options may be upgraded with a glacier landing. 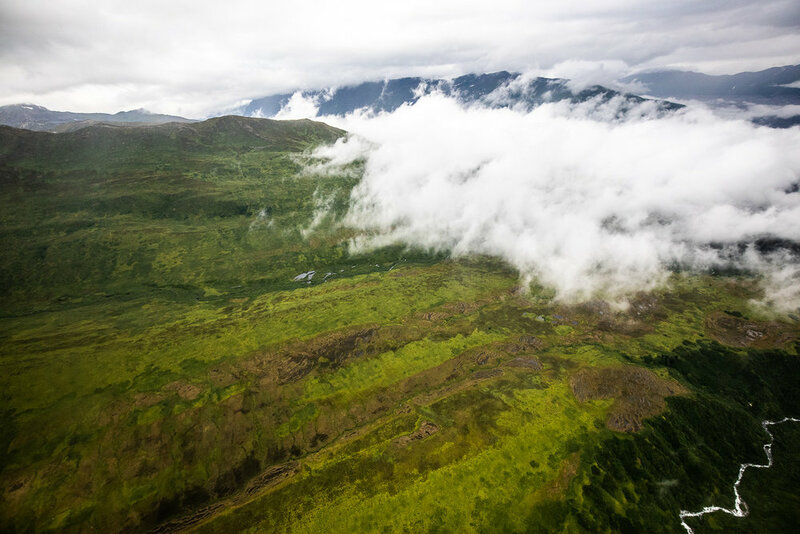 The day I decided to go on the flightseeing tour, I was informed by a customer agent that numerous clouds around Denali (the mountain) meant that Grand Denali was not offered that morning or afternoon. I opted to take the Mountain Voyager tour with the glacier landing. However, I was informed that the feasibility of a glacier landing would be at the discretion of the pilot once we got closer to the Alaska Range. 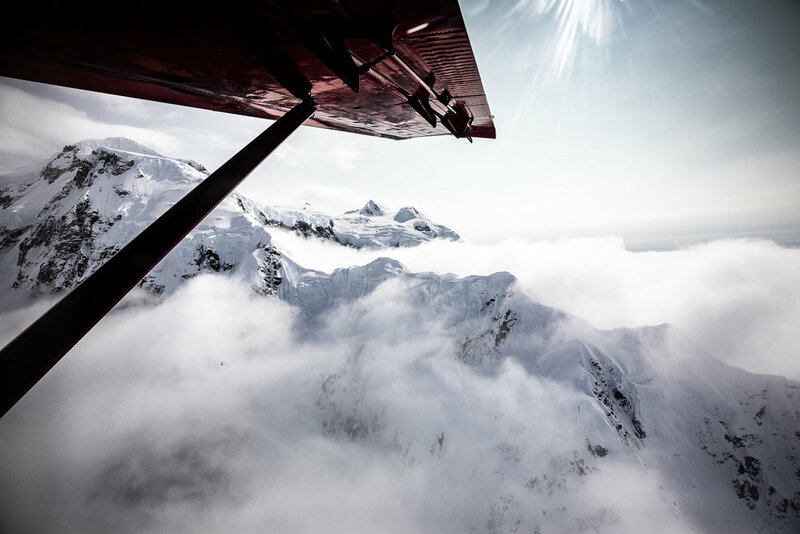 An overview of the Mountain Voyager trip with Talkeetna Air Taxi. Source: Talkeetna Air Taxi. A DeHavilland Otter, the plane on which the flightseeing tour would occur. 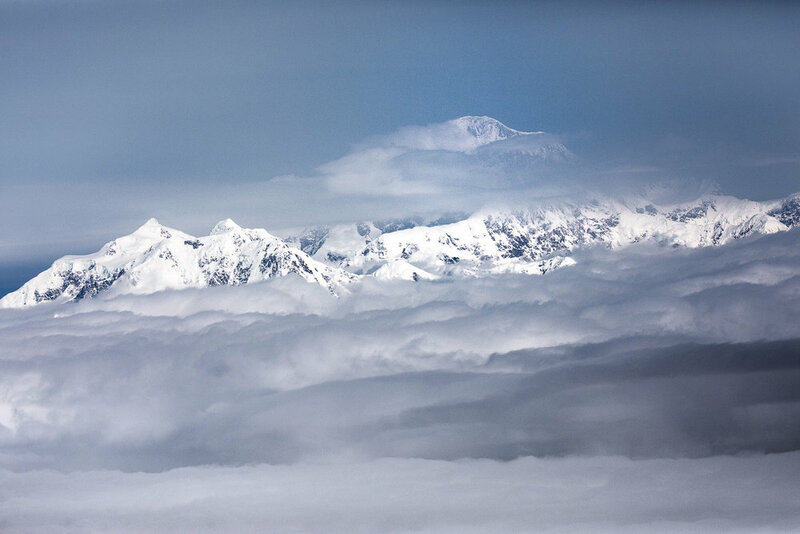 The rest of this post is divided into photos from the various stages of the flightseeing tour: Talkeetna surroundings, glacier fly-by, and the Alaska range of Denali National Park (including a photo of Denali). As we departed from Talkeetna Airport, the pilot flew fairly low so that the passengers aboard were treated to some great views of Talkeetna and its surroundings. Shortly after take-off from the Talkeetna Airport (TKA). Note the airport in the upper right of the frame. 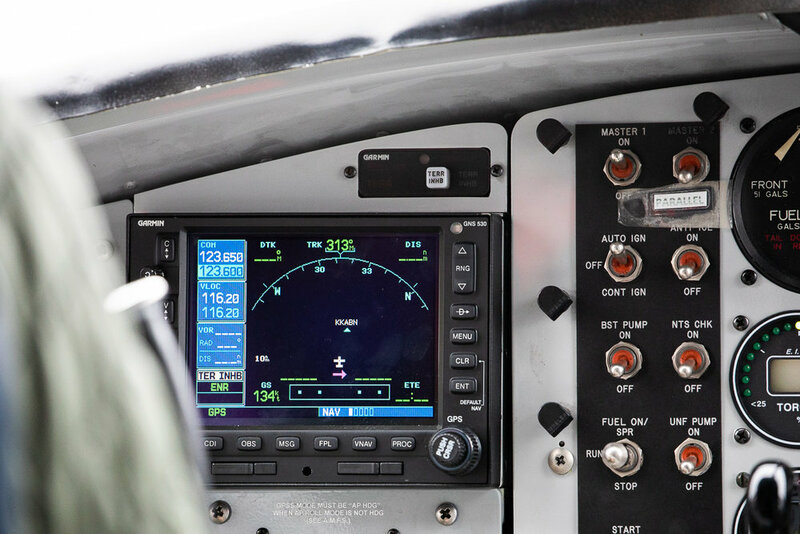 The instrumentation aboard the DeHavilland Otter. 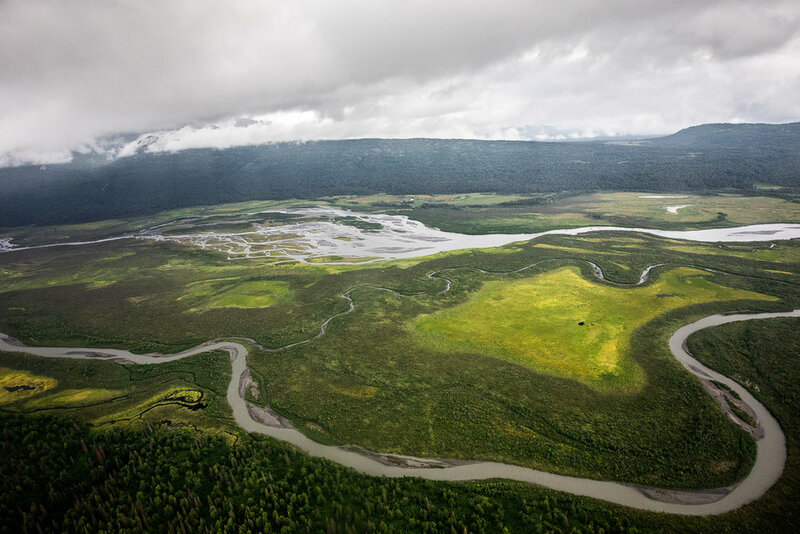 Three rivers, the Talkeetna, Chulitna, and Susitna converge at Talkeetna to become the "Big Susitna River." The name "Talkeetna" loosely translated, means "River of Plenty", or more literally, "Place where food is stored near the river", meaning a place where a food cache was located. The word "Susitna" in Den'aina Indian language means "Sand Island River". Chulitna means "Strait Hand River" though some locals translate it with "Tongue River". The Den'aina Indians were an Athabascan subgroup who inhabited the Upper Cook Inlet drainage. For some local residents Talkeetna simply means: "Where three rivers meet". As we flew over the Talkeetna valley, the rivers came into prominent view. 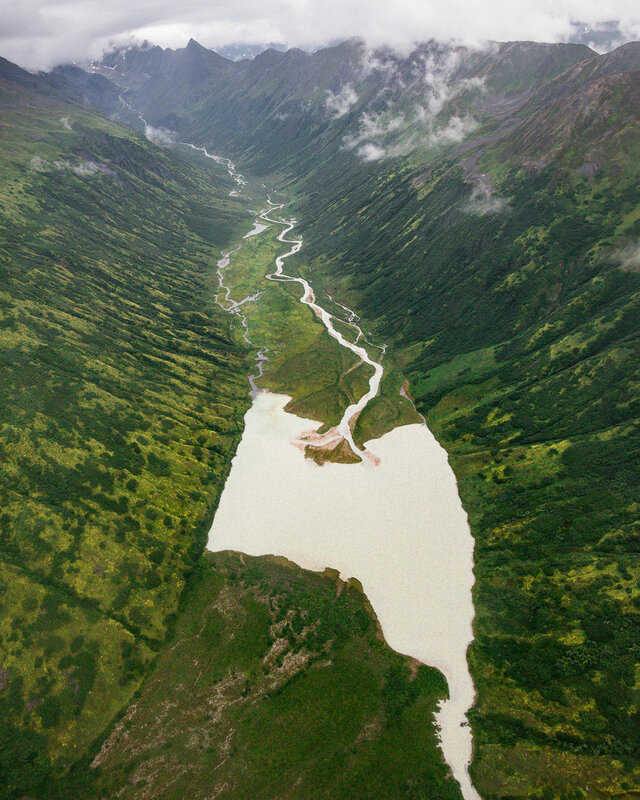 One of the rivers we flew over, on the way toward the Alaska Range. Talkeetna (the town) lies at the confluence of the Susitna, Chulitna, and Talkeetna Rivers. Glacial stream in the highlands. 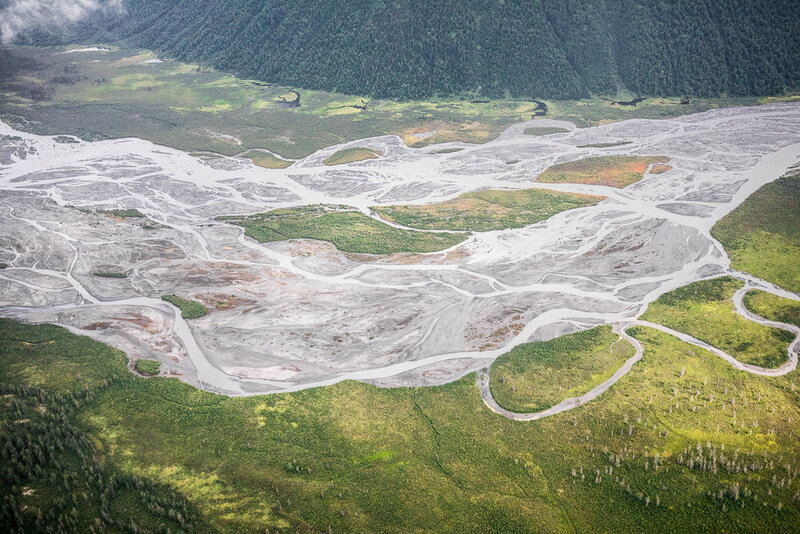 Glacial rivers from the nearby Alaska Range are the source for this silt-rich lake. Also posted on Instagram. After about thirty minutes after take-off from Talkeetna Airport, we were flying above glaciers. 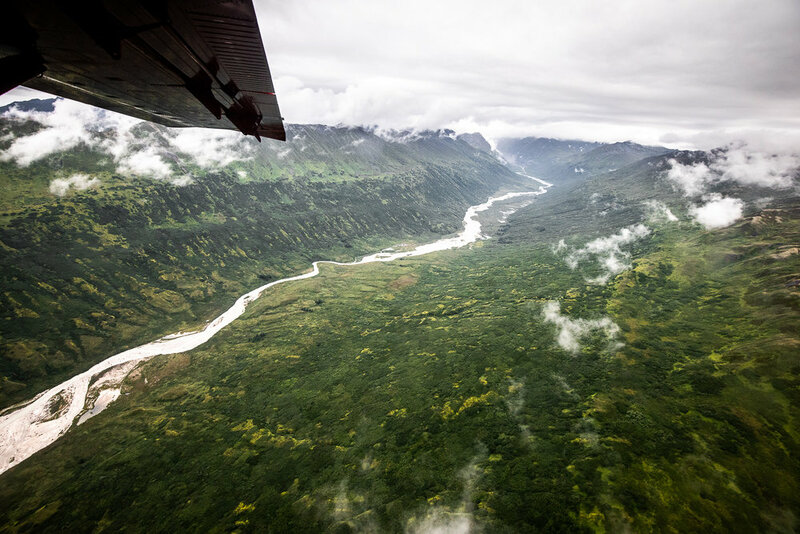 The Mountain Voyager flightseeing tour flies over the following glaciers: Kahiltna, Ruth, Tokositna, Eldridge, Kanakula, Buckskin, and Coffee. A selection of photos from the glaciers is below. Detail of a glacier. Note the numerous crevasses. Detail from a glacier and a moraine. 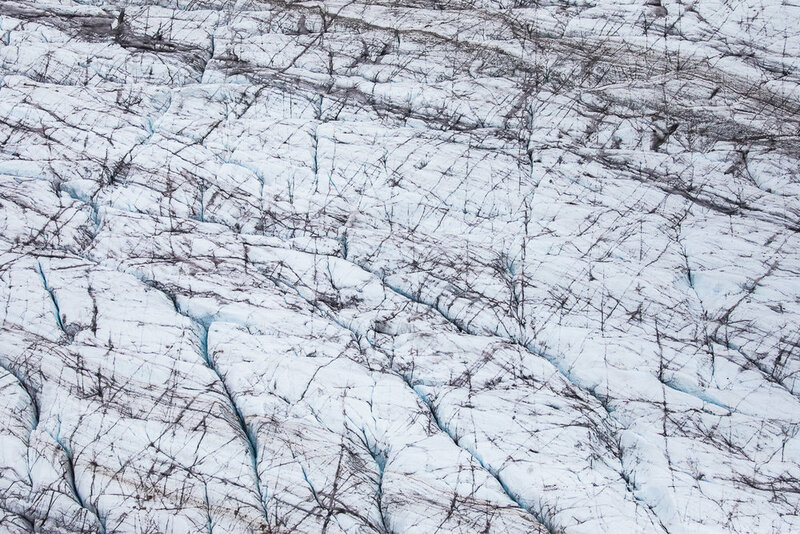 A zoom-in of the photo above, showing some detail of the ice and glacial moraine. Another perspective of flying over a glacier. About ten minutes after flying over the glaciers and increasing our altitude above the cloud layer, and we were flying amongst the majestic peaks of the Alaska Range. Around this time in the flight, the pilot informed our group (via headphones that we wore during the duration of the flight) that a glacier landing would not be possible that day because the low-lying clouds in the surrounding glaciers (such as the Kahiltna Glacier and the Ruth Glacier) made it too dangerous. As we flew over the mountains, our pilot identified various mountain peaks that were visible: Mount Hunter, Mount Foraker, Mount Denali, among others. I have to do additional research to identify the peaks visible below by name; if you recognize the mountain peaks below and/or are an expert at mountain identification, please leave a comment on this post or send me an email so I can update this post with the mountain names of the mountains visible in the photos below. Clear views of the mountains of the Alaska Range. Flying over the Alaska Range. Also posted this image on Instagram. Views of the Alaska Range and the wing of the Otter. Shrouded in between cloud layers. One of my favorite images from the flightseeing trip is the one below, where you can see the mountains, clouds, the wing, and the sun rays. Clear views on the other side of the Alaska mountain range. Do you notice where a likely avalanche occurred? Between the clouds in the Alaska range. Note the clouds layer on the far right of the frame. Finally, Denali itself! It was actually hard to be certain I captured a photo of Denali and was only able to verify after I came back from the flight and had the chance to review and post-process the images. Denali was shrouded in numerous clouds but at least the peak was visible! View of Denali (formerly Mt. McKinley). The peak of Denali is 20,310 feet (6,190 m) above sea level. View of Denali from a slightly different vantage point. The flightseeing experience was absolutely breathtaking, if the photos are any indication. 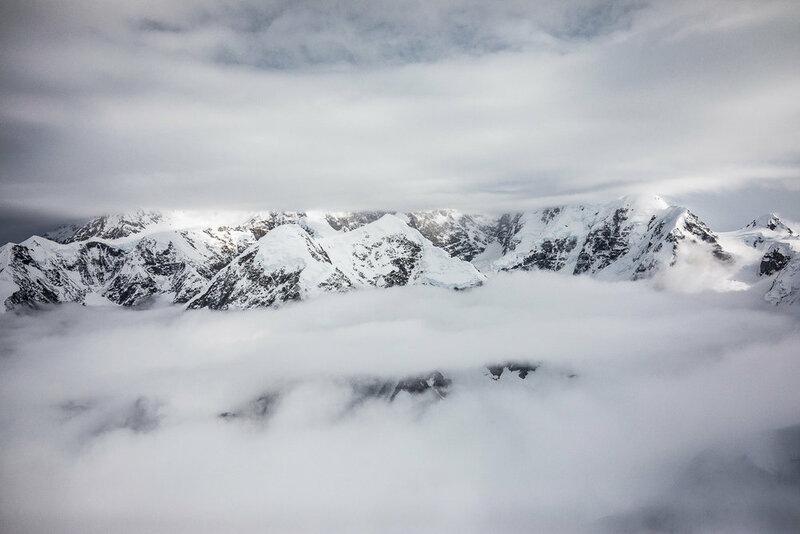 Some of the sensual experiences are hard to put into words—how cool the interior of the cabin became as we flew above the clouds in the Alaska Range—or the hesitation and trepidation one felt as we flew from a dense cloud layer and surfaced at around 11,000 to 12,000 feet! Even though we didn't get to experience the glacier landing on this flightseeing journey, it was something that we were prepared for (the Talkeetna Air Taxi customer representatives were very forthcoming about the conditions for a glacier landing being weather-dependent; we were refunded the glacier landing portion of our trip as soon as we landed back at Talkeetna Airport). In my opinion, we were lucky that we got to fly at all, as the previous two or three days the conditions were so poor that majority of the flights were cancelled. Such is the fate of so many activities in Alaska! Overall, I highly recommend booking a flightseeing tour with Talkeetna Air Taxi if you travel to Alaska and find yourself in Talkeetna. If you have a flexible schedule, the representatives at Talkeetna Air Taxi will work with you and advise you of best flying times and opportunities for a glacier landing; there are no hard selling tactics at the company as customer satisfaction is second only to passenger safety at the company (you are welcome to re-book or cancel your flight without any cancellation/re-booking fees). The five star reviews on TripAdvisor (at the end of August 2018, the average rating is 4.929 out of 5) for Talkeetna Air Taxi overwhelmingly speak of this customer-friendly company and the experience you can expect going on a flightseeing tour with Talkeetna Air Taxi. Talkeetna Air Taxi is located at 14212 E 2nd St, Talkeetna, AK 99676. GPS coordinates for the main office are 62.32150ºN 150.09802ºW. Flightseeing tours are offered year-round, except that the Grand Denali tour is not offered in the winter season.